Bone Health is the most cutting-edge bone strengthening and repairing nutrition ever formulated! Every 3 seconds an osteoporotic fracture occurs worldwide. Poor diet and lifestyle choices cause your body to rob crucial minerals which in turn weaken and destroy bone health leading to osteoporosis, a preventable disease literally crippling millions of individuals. 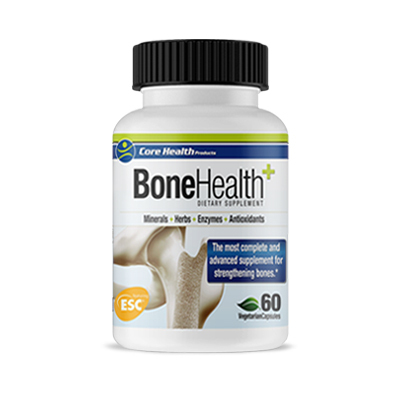 Bone Health by Core Health Products goes above and beyond with providing cutting edge nutrients that strength and repair the bone matrix with the most complete delivery system ever formulated. New research shows that taking calcium alone can weaken bone density instead of building it. Your bones require a matrix of macronutrients that all work in concert with one another. The primary players for bone health are calcium, magnesium, Vitamin D and Vitamin K2 but the trace minerals and vitamins are vitally important as well. Each play a significant factor in the proper absorption, utilization, transportation and bioavailability of building and maintaining bone structure. Millions of people take calcium supplements but few realize the body requires nutrition in its most complete form for proper utilization. Consuming high amounts of calcium, especially coming from an inorganic source, without the presence of Vitamin K2, allows for the potential of that calcium to be transported into your soft tissue and arteries but not your bones. Low levels of Vitamin K2 are now associated with an increased risk of heart disease and atherosclerosis. Bone Health’s formula combines the purest, whole food form of calcium derived from eggshells coupled with Vitamin K2 MK7 which plays a crucial role in the absorption of calcium and the reduction of arterial calcification. Each plant derived mineral and vitamin works synergistically together just as found in whole food forms from nature. Used for centuries in Chinese Herbal Medicine, Cnidium has been a powerful healing herb given mainly for reproduction but more recently has been found to improve osteoblastic cell activity. The osteoblast, the bone cell responsible for forming new bone, is found in the growing portions of bones. Cnidium activates those osteoblasts improving bone density and strength. An amazing herb that has the potential to fight and prevent osteoporosis. Cnidium’s anti-inflammatory properties pair beautifully with the cracked chorella in our proprietary Bone Health formula. These single celled algae are one of the richest and fastest growing food found on earth. The chorella growth factor increases the rate of tissue growth and repair making it a perfect ally in fighting degenerative disease such as osteoporosis. It’s an amazing alkalizing superfood that combats acidity, another known robber of precious bone building minerals. Bone Health formula includes our proprietary Mineral & Enzyme Delivery System known as M.E.D.S.™ This unique system uses the power of enzymes and fully-utilizable micronutrients to ensure maximum absorption and utilization of the nutrients and bioactive components. The M.E.D.S.™ nutrient delivery system is designed to match the specific needs of each individual nutrient by including the specific enzymes and micronutrients required to ensure maximum utilization and deliver superior results unlike any other. This is what makes our Bone Health supplement the most cutting-edge bone strengthening and repairing nutrition ever formulated.